TNR -- TV News and Reviews: Kings -- "Javelin"
Wow. Tonight's Kings episode, "Javelin" was one of the most frustrating, maddening, and nail-biting episodes of the season yet. Everyone was out for blood on this one, and characters took turns that I hadn't expected them to. 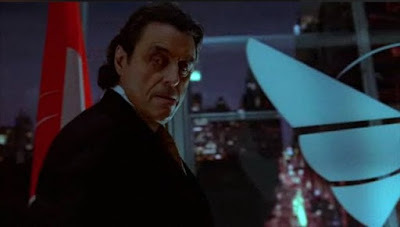 *SPOILER ALERT* King Silas (Ian McShane) has shuffled over time, back and forth between his own ambitions and his growing fatherly affection for David (Christopher Egan). To see him so hell bent on David's good name being destroyed and his life sacrificed so that Silas could stay in power...it was not the way I expected it to go. As Rev. Samuels (Eamonn Walker) pointedly observed, Silas has made bad decisions based on vanity and ego before, but Samuels never saw him as a villian. The breaking of trust he felt happened with David seemed to be a catalyst for his vengeance, but as David and Princess Michelle (Allison Miller) protest again and again, his argument beomes more about retaining power than anything else. He's angry at no longer being the one the people look to--he's being slowly supplanted by David's good name. 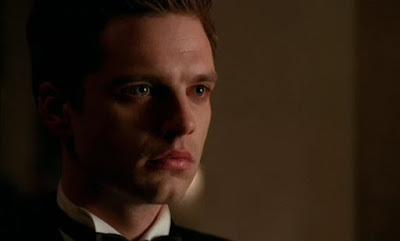 Prince Jack (Sebastian Stan) has been slowly showing signs of conscience as weeks progress, and no matter how he pushes a ruthless agenda or conspires with people who do, there's always the hint of regret in his eyes. With Silas so turned against David, it was difficult seeing Jack also stand up in court and falsely accuse David of treason--with doctored video and fake testimony. "You seem to have the teeth for flesh," Silas tells Jack proudly during a recess of David's trial. It was frightening how easy it was for Jack to twist the facts just enough to have David's own character witnesses second-guessing their own thoughts and feelings. After all, what's easier to believe: that David has divine luck, or that he was protected by the enemy? 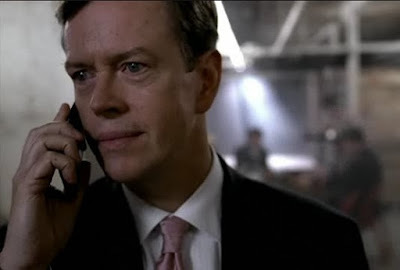 The king's brother-in-law William (Dylan Baker) plays a strangely duplicitous role in the "Javelin" episode. On one hand, he tells Jack that David getting prosecuted is a good thing, to help pave the way for Jack's supremacy. On the other hand, in exchange for Reverend Samuels help in their coup, he breaks David out of jail and offers him safe passage. David himself displays such an incredible purity of spirit in this episode of Kings, it causes a stirring of both admiration and frustration as he refuses to budge on his principles. "No one can be that good," Jack asserts when David warns him of the very plot to overthrow the king that he's involved with. David even refuses the safe passage from Rev. Samuels and William because it will prove everything the king has accused him of. 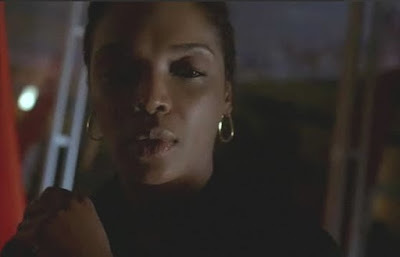 What hurt the most in the "Javelin" episode was Princess Michelle's betrayal. She's been shown many times to be weak when it comes to her family's manipulations, and though she attempts to defy them, they always manage to get her back in the end. In this case, Michelle discovers she's pregnant with David's child. Queen Rose convinces her that the king will never allow that child to be born, and so they have to hide the truth from him. She tells her to keep her distance from David to avoid any suspicion. After promising to testify on David's behalf, to be the only one in her family standing with him, she doesn't show up in court. She's decided to protect her unborn child and sacrifice the child's father instead. Kings continually shows us that all the characters live in shades of gray. In the "Javelin" episode we discover that Rev. Samuels' wife was murdered in the past, and that when the killers were caught, he asked Silas to kill them and have their existences wiped clean from record. Silas felt that having done that for Samuels, Samuels should understand that Silas now wants to do whatever necessary to protect his own family from attacking elements. "You can'be both the lion and the lamb," he tells Samuels. Another character falls in Kings as well, and this time it's Thomasina (Marlyne Afflack), the king's trusty right-hand woman. Reminding her of her promises of devotion and service, and his promise of promotion, he orders her to have one of the witnesses in David's trial killed so that the truth can never be found out. Thomasina is clearly conflicted, but she follows orders. 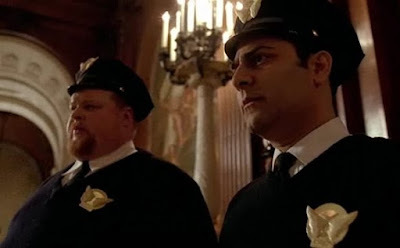 There's a touching scene afterward, when she goes back to our two favorite palace guards, Boyden (Jason Antoon) and Klotz (Joel Marsh Garland). Klotz had finally professed his love for her in an earlier scene, and she confronted him with it now. "And you would love me, no matter what I've done?" she asks, and he affirms. Thomasina kisses him gently, in thanks. By the end of the "Javelin" episode, things look bleak for David. His love has turned against him, the mob outside, his king and his prince. When King Silas cruelly manipulates David into thinking that he has failed his king and kingdom, by becoming more loved than the country's leader, he actually convinces David to fall on his sword and claim his guilt in court. David's final act of utter selflessness, confessing to something Prince Jack knows he didn't do, finally snaps Jack's resolve on this brutal course of action. I loved it when he told David to stop talking, just like an older brother might shush a sibling in exasperation. In open court, he confesses to the lie, and accuses himself and his father of treason. There's a nasty altercation as Silas flies into a rage, howling angry slurs at his son before confirming David's guilty sentence and ordering that his son and David be hauled away by guards. The guards take Jack outside, where he's met by another set of guards with guns. Jack expects he's to be immediately executed, then finds that his uncle William has brought these guards. William is excited about the latest turn of events, and feels it will be even easier to overthrow the king. Silas' outburst on TV and his smearing of a country hero has turned the mob against him. So it appears Prince Jack has finally come out on top for once--after following his conscience. He's finally outright defied his father, rather than the passive-aggressive ways he's annoyed him in the past. I'm not sure what this means about Jack's personal development, however--will his ambition still outweigh his conscience? And David's future remains uncertain. With popular opinion so swayed against him, Silas might not follow through with executing David. After all, the public's view has saved David's life a few times before. Silas will be even more desperate than ever to retain his crown and the people's love. Tune in next Saturday for the next episode of Kings, at 8/7c on NBC. Catch up on any of the Kings episodes you missed by visiting NBC's official Kings website. PHOTOS: Ian McShane as King Silas; Sebastian Stan as Prince Jack; Dylan Baker as William, Allison Miller as Princess Michelle and Christopher Egan as David; Marlyne Afflack as Thomasina; Jason Antoon as Boyden and Joel Marsh Garland as Klotz; David and Jack, Kings screencaps, c2009 UMS, NBC.